Use This Handy Baby Gear Checklist To Make Sure You Have All The Baby Equipment You Need For Your Baby. Just Print It Out And Tick Off As You Go. And Remember, If You Don't Need It You Won't Find It On This List! The baby gear included on this list is the stuff that I really used over and over through my four little ones. If it was gimmicky or I didn't really need it you won't find it listed here. I know my baby budget was bursting at the seams by the time I finished shopping for my first born and I'll bet you're feeling the pinch too. So I'll tell you which baby gear options worked the best and why, so that you can spend your hard-earned cash on the baby stuff you'll really use. Remember: Kitting out your house for baby number one is unbelievably expensive, but the items on this baby gear checklist will last you through as many babies as you have if you buy quality. Unlike nursery decor, baby gear should be seen as an investment. It's worth spending a little extra to make sure you get something that will last. This is one item of baby gear that I would really recommend splashing out on if you can afford it. You will use it almost every day for two to three years with each child - it's worth getting the best one you can afford. I recommend the travel system over the separate stroller and car seat because they are so easy to use. I started out with a separate stroller and ditched it for the travel system with baby number three. It was a really good decision as it turned out. Being able to transfer your sleeping baby from the stroller to the car and from the car to your home without having to wake him by lifting him out of the seat is a priceless convenience! My Top Tip: When you buy, check for a comfortable weight, easy folding mechanism and make sure the stroller will fit easily into the trunk of your car. I cannot recommend this brilliant invention highly enough! I used mine every day for each of my babies' first years. It bought me countless hours of sanity when I needed my hands free to cook, clean, do laundry - it's no joke trying to do everything with a baby on your hip! This item is an absolute must-have on your baby gear checklist! This little chair was one of the best items of baby gear I ever bought. I used it everyday, everywhere I went. It allows your baby to sit upright from an early age so that he can interact with the environment and people around him - great for preventing boredom. You can attach an optional play tray to it and baby can eat in it, read in it, play in it or just sit and look around. I recommend them over the traditional bouncy chair, because they are just so versatile. They're small and portable making them perfect for a trip to the beach or lake, a friend's house or a restaurant or anywhere else you need to go with baby. You can pick one up for under $40 at Amazon.com and it will last you through all your babies no matter how many you are planning - they are virtually indestructible! Find one with a changing pad included with lots of pockets for diapers, creams, wipes, bottles, pacifiers etc. You will need to take loads of baby stuff with you wherever you go with baby. And you'll need to get to those things quickly and easily. Whether you are intending to breastfeed or bottle feed your newborn, a nursing pillow is an essential item on your baby gear checklist. I recommend My Brest Friend Pillow. It has a wrap around design to prevent slipping which is a common complaint with the Boppy Pillow. A sound monitor allows you to hear your baby from wherever you are in your home so you'll know when you need to go and pick her up. This is another absolute new-mom essential. I couldn't have survived without one. Some monitors also include a video feature so that you can see your baby, and others have a movement detector that sounds an alarm if your baby stops breathing for longer than 20 seconds. If you're worried about SIDS a movement monitor provides invaluable peace of mind. My Top Tip: Look for a monitor that has a clear signal, a large movement pad to minimize false alarms, and indicator lights. I recommend the BebeSounds Angelcare Movement Sensor and Sound Monitor. It has been an absolute sanity-saver for me! This is useful for keeping your young baby close to you while you are getting a few things done around the house. Does folding the laundry sound familiar? Young babies don't sleep for very long at a time in the beginning and when they're not sleeping they like to be held. To have any hope of keeping your home in a livable state - you have to have a pouch on your baby gear list! Baby carriers are also a wonderful help if you have a colicky baby. The warmth of your body against that little tummy is very soothing and calming. 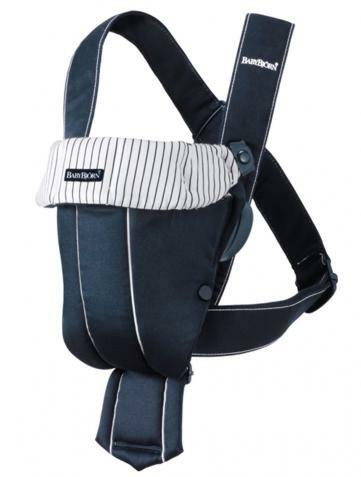 I recommend: The Baby Bjorn Carrier - all four of my babies have loved it. You can postpone adding a high chair to your baby gear checklist until your baby is around nine months of age. You needn't stress about it yet, but this is another item on the baby gear checklist that is worth spending a little extra on. You'll use it for a good two years per child, anything between three and six times a day so it's worth spending some money on it. You'll use it for much more than just feeding your baby I promise you! My Top Tip: Get a high chair that is easy to keep clean - no cracks, crevices or bits that can't be removed for cleaning! If you have a baby that is susceptible to allergies you may want to move this item up to the essential baby gear checklist, because you will use it a lot in this case. (You may also want to add an air purifier to the list.) None of my babies had allergies so I only used mine for the occasional cold. It wasn't essential but it was still nice to have it when I needed it. We didn't travel or go out at night a lot when our babies were young. I believe in a strong home-based routine in the early months - and I had four babies sleeping through from eight weeks to show for it, so to me it was worth the short-term sacrifice of staying home. However, my sister just can't sit still for five minutes so her little one goes with her wherever she does no matter what the time or occasion. If you are like her you'll need a portable crib desperately! I hope you found this baby gear checklist helpful - I wish I'd had one when I was starting out! It would have saved me endless time and money! Don't forget to send us your baby gear reviews - the more info we have, the more we can pass on!